And North Korea shares their nuclear technology with terrorist Iran. North Korea abruptly ended a 10-week pause in its weapons testing Tuesday by launching what the Pentagon said was an intercontinental ballistic missile — possibly its longest-range test yet — a move that will escalate already high tensions with Washington. US experts now believe that Washington D.C. and the US east coast is within range of North Korea’s missiles now, the Washington Post reported. Pentagon spokesman Col. Rob Manning said the missile was launched from Sain Ni, North Korea, and traveled about 1,000 kilometers (620 miles) before landing in the Sea of Japan within 370 nautical kilometers (200 nautical miles) of Japan’s coast. It flew for 53 minutes, Japan’s defense minister said. South Korea, a key U.S. ally separated from the North by a highly militarized border, responded with shorter-range missile tests of its own to mimic striking the North Korea launch site, which it said lies not far from the North Korean capital. The launch is North Korea’s first since it fired an intermediate range missile over Japan on Sept. 15, and it appeared to shatter chances that the hiatus could lead to renewed diplomacy over the reclusive country’s nuclear program. U.S. officials have sporadically floated the idea of direct talks with North Korea if it maintained restraint. 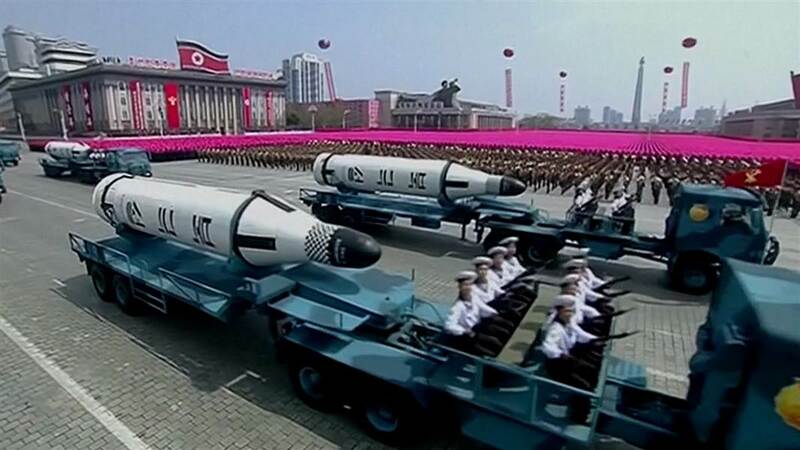 An intercontinental ballistic missile test is considered particularly provocative. It would signal further progress by Pyongyang in developing a weapon of mass destruction that could strike the U.S. mainland, which President Donald Trump has vowed to prevent — using military force if necessary. In response to the launch, Trump said the United States will “take care of it.” He told reporters: “It is a situation that we will handle.” He did not elaborate. U.S. scientist David Wright said that based on initial reports on the altitude and duration of the test, it appeared to be North Korea’s longest-range test yet. If flown on a standard trajectory rather than at a lofted angle, the missile would have a range of more than 13,000 kilometers (8,100 miles), said Wright, a physicist at the Union for Concerned Scientists. Echoing the initial U.S. assessment, Japan’s Defense Minister Itsunori Onodera said the missile was likely an intercontinental ballistic missile. He said it was launched on highly lofted trajectory and reached a high point exceeding 4,000 kilometers (2,400 miles) — exceeding the height of previous missile tests. He said it flew for about 53 minutes. “We can assume it was ICBM-class,” Onodera said. Seoul’s Joint Chiefs of Staff said the U.S. and South Korean militaries were analyzing the launch data from the missile. It said it traveled a distance of 960 kilometers (600 miles) and estimated the apogee at 4,500 kilometers (2796 miles). In response to the North Korean test, it said South Korea conducted a “precision-strike” drill, firing three missiles, including one with a 1000-kilometer (620-mile) range, to accurately hit a target that stood for the North Korean launch site. South Korea’s presidential office said it was holding a National Security Council meeting Wednesday morning local time to discuss the launch. Japanese Prime Minister Shinzo Abe called for an emergency meeting of the U.N. Security Council. He said Japan will not back down against any provocation and would maximize pressure on the North in its strong alliance with the U.S.
“We will not tolerate North Korea’s reckless action,” he told reporters. The test is likely to trigger moves by the U.S. and its allies to condemn North Korea’s latest test as a violation of Security Council resolutions that prohibit its use of ballistic missile technology and possibly seek more sanctions. Trump has ramped up economic and diplomatic pressure on the North to prevent its development of a nuclear-tipped missile that could strike the U.S. mainland. Thus far, the pressure has failed to get North Korea’s totalitarian government, which views a nuclear arsenal as key to its survival, to return to long-stalled international negotiations on its nuclear program. U.N. Security Council President Sebastiano Cardi said he was scheduled to brief the council Wednesday. Tuesday’s launch came as the U.S. discussed with South Korea next steps on North Korea. The South’s top nuclear negotiator, Lee Do-hoon, was in Washington for talks with Joseph Yun, the U.S. envoy for North Korea policy.